PowerBar | Healthy Product Reviews!! Now, I’m more of a granola bar kinda girl over protein and “energy” bars (Clif being my exception- love you!! ), because usually they are filled with too much protein (at least in my opinion for what I’m looking for in a bar), too much saturated fat, and too much sugar. 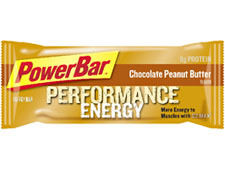 However, PowerBar has a line of products that fit everyone’s needs. They have ones for pre workout, recovery/post workout, ones with lower sugar, etc, and all of them have all natural ingredients. POWERBAR C2 MAX dual-source energy blend. More sustained energy to muscles. Low in fat, packing 41–45g of carbs and 8–10g of protein with 230–250 calories per bar. These bars come in 14 flavors, and you know me, I chose the Chocolate Peanut Butter. Because, reallly, when has the combination ever failed? So, moving on to the bar. It’s 2.29 ounces, so about average, I’d say the size of a Nutri-grain bar, but a little longer. It isn’t your typical bar, however. The texture and appearance sort of resemble an oversized tootsie roll. Chewy and easy to rip apart, but definietely reminded me of a tootsie roll. It was pretty dense, and had “crispy” rice pieces in it. It was definietely sweet. The chocolate flavor overpowers the peanut butter flavor, and it takes on an almost coffee-ish taste. But, I liked it! It was tasty and I actually enjoyed it. I DID need a glass of water to drink though while eating. The sodium was a tad high (200 mg) and the combination of chocolate and peanut butter just begged my mouth for some aqua. Overall, I enjoyed this and will probably buy it again. I give it 4 stars, because it did as it promised. The PowerBar’s C2 Max dual source energy blend (how much of a commerical do i sound like now? 😛 ) provided me with a ton of energy- I actually got one of the best workouts despite the fact it was 630 in the morning! It was also very easily digested- I didn’t feel sick while working out and I only ate the bar 30-45 minutes prior. The only thing I didn’t like was that it lacked fiber, so it isn’t a good “meal replacement” bar. But, that’s not really what it’s intended for and I think if they increased the fiber too much, it would be harder to digest. I also wish there was a bit more peanut butter flavor in it-but still yummy 🙂 I also REALLY want to try the Cookies & Cream and Caramel Cookie flavor. Yum! 1 bar is 240 calories, 3.5 grams of fat ( 1 saturated), 44 caarbohydrates (26 sugars), 1 gram of fiber, and 9 grams of protein. You also get 25% calcium needs! C2 MAX CARBOHYDRATE BLEND (ORGANIC EVAPORATED CANE JUICE SYRUP, MALTODEXTRIN, FRUCTOSE, DEXTROSE), OAT BRAN, SOY PROTEIN ISOLATE, RICE CRISPS (MILLED RICE, RICE BRAN, ROSEMARY EXTRACT), BROWN RICE FLOUR, PEANUT FLOUR, NATURAL FLAVOR, NONFAT MILK, AND 2% OR LESS OF: PEANUT BUTTER, CHOCOLATE, ALKALIZED COCOA, CANOLA OIL, VEGETABLE GLYCERIN, SALT, ALMOND BUTTER, MINERALS: CALCIUM PHOSPHATE, POTASSIUM PHOSPHATE, FERROUS FUMARATE (IRON), VITAMINS: ASCORBIC ACID (VITAMIN C), VITAMIN B6 HYDROCHLORIDE, RIBOFLAVIN (VITAMIN B2), THIAMINE MONONITRATE (VITAMIN B1).